Many people underestimate how difficult Christopher Durang is to perform. With a snarky and dark sense of humor, bordering on the macabre, Durang leaves nothing uncommented in his plays. 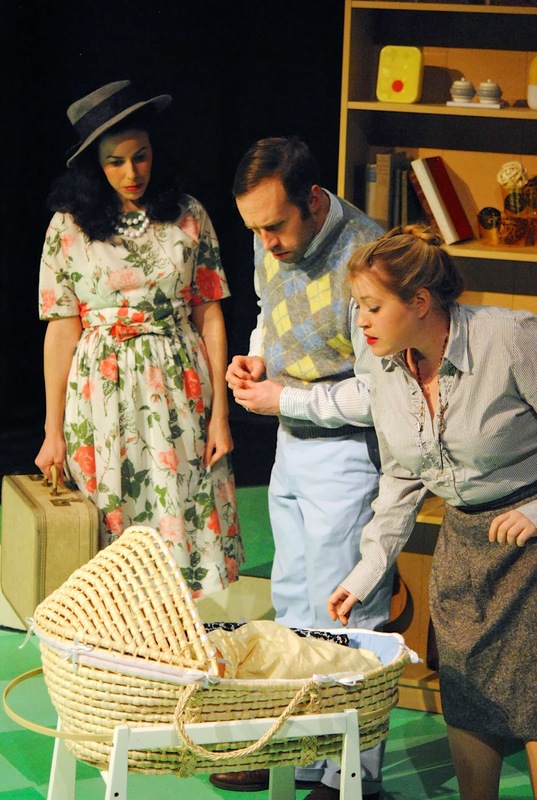 Happy Medium Theatre’s Baby with the Bathwater performs the play with a sensitivity and awareness of the biting ultra-realism of one of Durang’s most famous and crowd-favourite work. Directed by 2013 My Theatre Award Nominee Lizette M. Morris, the play is a highlight of Happy Medium’s work. The production performs as a testament to the strong acting, outstanding vision, and smart directing inherent in the company. The play tells the story of newbie parents, Helen (played with melodramatic glamour by Denise Drago) and John (played with hilarious sincerity by Jeremy Towle) as they embark on the journey of parenthood with the slightly twisted (by nature or nurture) Daisy (played in his young adulthood by Mike Budwey). While Drago and Towle zing in their opening scene, their strongest moments are their contentions because of the introduction (and influence) of Nanny (played with the perfect comedic timing by Nicole Howard). Howard quickly became one of my favourite performers throughout the production with her ability to transform into her roles with seamless mannerisms and characteristics. The scenes amongst Drago, Towle, and Howard bring down the house with laughter as they remark on the difficulties and sensitivities of raising a child. Equally dynamic and manic, Drew Linehan’s Cynthia is a crazy woman who lost her baby and attempts to coo and sing to Drago and Towle’s own baby, Daisy. Linehan startles and surprises in her role, throwing herself into the role with gusto and senseless abandon. The success of each of these roles is in the actor forgetting the macabre and absurdity within their dialogue. And Director Lizette M. Morris coaches and guides the cast with expert ease into a steady uncomfortableness and earnest portrayal of these well-meaning but always off-putting characters. Yes, the play performs as every mother’s worst nightmare with one-line zingers, off-their-rocker nannies, crazed neighbors with killer dogs waiting to kidnap the baby, and first-time parenting woes (who can change satanic lullabies to more humane and comfortable lyrics?). Underneath the craziness, the humanity of fearing whether our mistakes as parents will inform and transform their children’s lives into something less than ideal. How much of our lives and who we are is dictated by the choices made by those who raise us? Happy Medium’s season boasts a theme of “Home is where the horror is,” and this play is a delightful thrill-fest. Though the humor may not be everyone’s cup of (chamomile) tea, the production stirs up laughter to keep you smiling through the darkness. Only after leaving the theater do you realize that you just laughed about mothers smothering newborns, babies who pretend to be baked potatoes, and adulterous husbands and fathers. While Meagan Becker’s costume design is flattering and sets the time period and mood with charming efficiency, it’s the scenic designer by co-designers Morris and Deirdre Benson that steals the show. Easily the most useful and resourceful accents to the drab Factory Theatre’s space, Morris and Benson’s off-kilter and angular set design perfectly accent the play’s humor. Benson also deserves a strong nod for her clever sound design, which is evocative of the time period while offering a timeless humor and poignancy to it all. The productions charms and wins accolades for its effortless humor, while creating real struggles beneath these fantastical and over-the-top characters. The humanity of raising a child is not lost in Durang’s hysterical comedy, making it Morris’ best work to date; a less talented and insightful director would have fallen into the play’s many pitfalls and the cast would have succumbed to the challenges of Durang’s manic characters. Instead, this is one baby of a performance that was nourished with love and care, tenderness and affection, and I was lucky enough to see the grown-up version, an impressive testament to what Happy Medium is able to do with the right director, cast, production team, and play. See Happy Medium Theatre’s upcoming production of Lebensraum by Israel Horovitz, directed by Brett Marks. The production stars R. Nelson Lacey, Audrey Lynn Sylvia, and Michael Underhill. Lebensraum plays May 9 – 24, 2014 at The Factory Theatre, 791 Tremont Street, Boston, Massachusetts. More information can be found here, including ticket purchases.